Older adults (60+) have the lowest SNAP participation rate in Oregon and across the country. Help more older adults connect to food assistance! There are many reasons older adults participate at lower rates in the Supplemental Nutrition Assistance Program (SNAP). Barriers like not knowing what the program is and that it provides food assistance, misinformation about eligibility, difficulties with navigating the application process, or stigma affect older adult access. However Oregon has done a lot to simplify the application process, expand eligibility, and increase older adult access to SNAP. When applying for SNAP, older adults have different options to consider with their application. Anyone who is at least 60 years old or has a disability can claim out of pocket medical costs on their SNAP application, which may mean they can qualify for more benefits; proof of these costs is required. Learn more about what are considered out-of-pocket medical expenses. If an older adult lives with family they may be able to apply for SNAP on their own even if they are unable to purchase and prepare meals separately because of mobility difficulties. For those that may have trouble getting to the store, a trusted person is allowed to use their SNAP benefits for them. To make this happen, an alternate payee form can be filled out and turned in with an application or at any time. 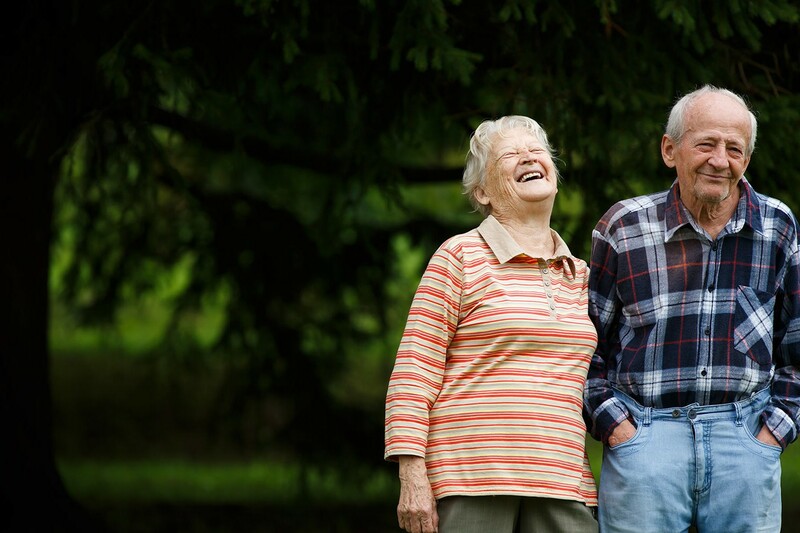 For some older adults (65+) in Oregon, that live in Clackamas, Columbia, Multnomah and Washington Counties they can receive their SNAP benefits as a direct deposit, check or on an EBT card which allows for ease of use. 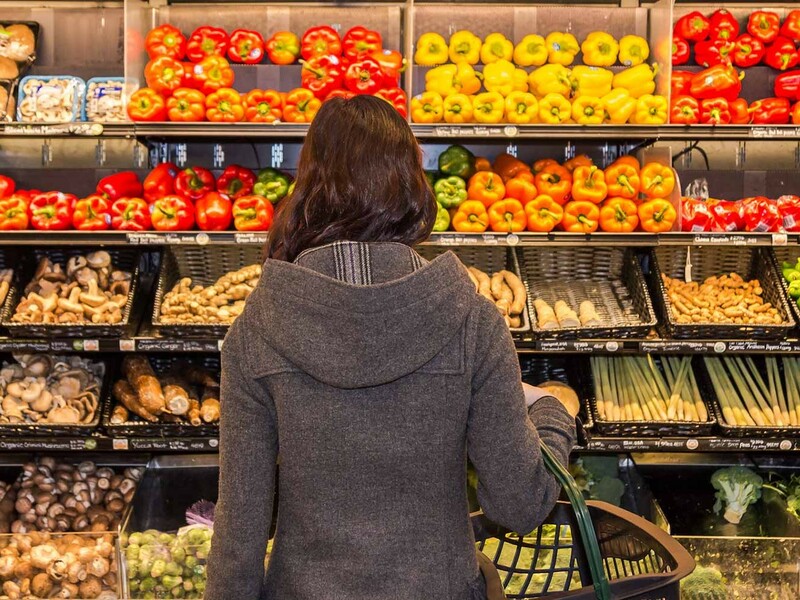 SNAP is there when you need help buying food. Similar to social security, you have already paid into the program with your tax dollars, so it is there for you if you come across hard times. Many Oregonians use SNAP. There is enough for all who are eligible. SNAP is easy to use. Kids who eat breakfast at school do better on tests, attend class more often, and are more likely to graduate. Breakfast is a powerful anti-hunger tool, but unfortunately only about a third of children who are eligible for free school breakfasts take advantage of the program. The November School Breakfast Challenge was created to increase breakfast participation in Oregon, and help schools achieve great results through school nutrition. In November 2018, we are kicked off the fourth annual November School Breakfast Challenge to support schools working to boost their breakfast participation! Join us in celebrating the 2018 winning schools! We greatly appreciate all the participating schools’ time and dedication; from sending home extra parent materials, to adding new items, to even changing where and when they served breakfast–everyone went the extra mile to reach more kids! Grants for School Nutrition Programs are available for schools participating in the 2018 November School Breakfast Challenge. Funds are specifically targeted for educational and training opportunities to increase school meal participation. Please contact Fatima to learn more. The Let’s Do Breakfast, Oregon! campaign is a collaboration of Partners for a Hunger-Free Oregon, Oregon Dairy and Nutrition Council, and Oregon Department of Education Child Nutrition Programs. are eligible for free school breakfast, but only about 110,000 participate. Help us connect more kids to school breakfast through the work of Partners for a Hunger-Free Oregon. There are many ways to reach Oregonians with information about SNAP. You can help spread the word about this vital food assistance program through SNAP outreach. SNAP outreach is grounded in positive messaging that shares the basics of the program, provides eligibility information, addresses misconceptions, and helps direct people to easy ways to apply. It answers the questions: what is SNAP, who qualifies, and how to apply. Effective SNAP outreach strategies reach people where they are already accessing information or resources. This can look like posting outreach materials in public settings, having volunteers in a food pantry share SNAP information, screening for food insecurity in a clinic setting and providing SNAP referral information, or connecting people to SNAP as part of an intake process when someone is accessing other support programs like energy assistance or school meals. Trusted community groups and individuals can help lower stigma and connect people to SNAP through simple actions that have a powerful impact. We know that it can feel daunting to share about SNAP especially when it seems like there’s a lot of information to convey. That’s why we provide in-person and online trainings. Our trainings address the basics of the program, navigating the application process, eligibility guidelines, effective outreach strategies, and how to provide application assistance in a simple way that helps you focus on the key information you need to know. Reach out to us if you are interested! Outreach can focus on specific population groups that have lower SNAP participation rates. In particular, older adults, students of higher education, single adults 18 to 50 without children, and families with mixed immigration status participate at lower rates. This can be because of barriers like additional eligibility requirements or misinformation, difficulties with navigating the application process, stigma, or many other reasons. 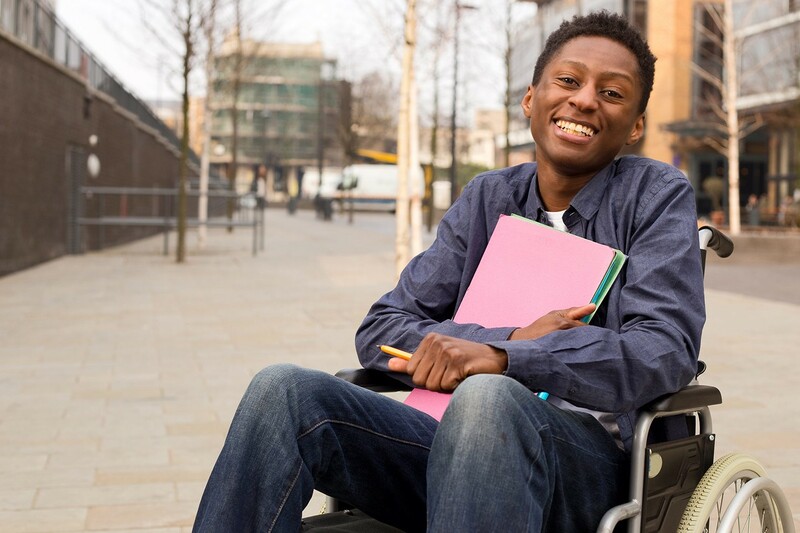 One way to address barriers is to learn about the specific eligibility requirements that certain groups, like students and single adults 18 to 50, may need to meet. 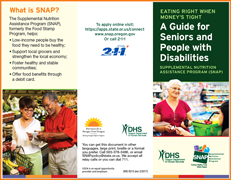 Another is to provide application assistance to people who may need extra help applying for SNAP, such as older adults. We offer technical assistance and guidance with outreach strategies, resources and materials, and SNAP information. We help individuals navigate their SNAP case if they encounter any issues or if they think a wrong eligibility decision was made. Learn from others that conduct SNAP outreach throughout Oregon. Join O-SNAP, a statewide outreach listserv, participate in-person meetings or trainings, and get referrals to organizations doing this work in your area. Need help starting a program in your community? Since 2009, Partners For a Hunger-Free Oregon has provided small grants to new or expanding summer meal programs in Oregon through the Summer Meals Support Fund. Now in its tenth year, we have provided small grants and technical assistance to over 150 unique organizations, awarding over $720,000. Grants are awarded up to $5,000 per program. Grant funds support new and existing programs with equipment purchases, staffing, transportation costs, and activity and outreach supplies.In addition to financial support, we strive to work one-on-one with grant recipients to promote best practices, raise awareness, and provide technical assistance and/or support throughout the state. More college students than ever are struggling with hunger. SNAP is a resource that can help. Students 18-49 who attend higher education at least half-time may be eligible for SNAP by meeting income guidelines and additional criteria. *Students attending class less than half time and those age 50+ do not need to meet additional criteria, only income. A Career and Technical Education (CTE) course or program. This can include prerequisites. A Career Pathways course or program. This can include prerequisites. A course considered by the community college college to be remedial, adult basic education, literacy or English as a second language. Students will need to have the community college verification form completed by an informed school representative confirming their enrollment in these courses or programs of study. Students cannot be participating in any school meal plan. Students on a break from school must still meet student criteria. Students under the age of 22 who still live with their parents must apply with their parents. Financial aid recieved through the Veterans Administration or private scholarships count as income. Note: federal financial aid including Pell grants, Perkins loans, Stafford loans and most work-study is not counted as income against student eligibility. Students may defer federal student loan payments while receiving SNAP benefits without incurring interest charges. SNAP benefits will be made available to you on a monthly basis. Funds appear on your Oregon Trail EBT card, which looks and works like a debit card. You swipe it as you would a debit card, select “EBT” as the payment method, and enter the pin # that was assigned to you. No one except the cashier will know that it is an EBT card. Partners for a Hunger-Free Oregon (PHFO) works with local communities and statewide leaders to improve the program at many levels through identifying access barriers, implementing new policies, and increasing participation statewide. We focus on strategies to increase access and participation of underserved populations including older adults and students. Our outreach staff travel across the state providing training, tools, outreach materials, and support to community partners. You may be able to get SNAP if you are working, receiving unemployment, or attending school. See if you are eligible and learn how to apply. There are new time limits for some SNAP participants in Oregon. These time limits are for able-bodied adults without dependents (ABAWDs) and affect SNAP participants in Benton, Clackamas, Lane, Marion, Multnomah, Washington and Yamhill Counties. Partners for a Hunger-Free Oregon (PHFO) and DHS produce original materials for SNAP Outreach. Students of higher education 18-49 need to have additional requirements for SNAP eligibility. Outreach support, presentations, & information for your community. Eat locally and match your SNAP benefits at these farmers markets around Oregon! Need to Speak to Someone at DHS? Find the contact information of your local branch office. There are new time limits for some SNAP participants in Oregon. These time limits are for able-bodied adults without dependents (ABAWDs) and affect SNAP participants in Benton, Clackamas, Clatsop, Deschutes, Jackson, Lane, Linn, Marion, Multnomah, Polk, Tillamook, Washington, and Yamhill Counties. These rules are new starting January 1, 2019 in Clatsop, Deschutes, Jackson, Linn, Polk, and Tillamook Counties. Individuals considered “ABAWDs” may only receive SNAP benefits for a total of three full months within a three year period – unless the person meets an “exemption” or complies with certain work requirements. Live in Benton, Clackamas, Clatsop, Deschutes, Jackson, Lane, Linn, Marion, Multnomah, Polk, Tillamook, Washington, and Yamhill Counties? Between the ages of 18 and 50? Do NOT have a child under the age of 18 living with you? Take a short quiz to learn if the time limits may affect you. Even if you are considered an “ABAWD” you may not be subject to the time limits and work requirements. Many people meet exemptions which are listed below, but be sure to contact the Department of Human Services (DHS) to report your exemption reason. Working 30 hours or more per week or earning at least $935.25 a month. Self-employed and earning at least $935.25 a month, if there are no costs for the business. If there are business costs, earnings need to be at least $1,870.50 a month. Receiving wrap-around or support services from a community-based organization for physical, mental, and/or behavioral health. You are a refugee and working with a federal refugee resettlement program. Participating in a drug or alcohol treatment program (inpatient or outpatient). Live in a household with any child under 18. Does not need to be your child, but child must be on your SNAP case. Providing care for an incapacitated or disabled person that limits your ability to work (you do not need to be living with this person). How can I meet the work requirement? Volunteering with a non-profit or faith-based organization on a regular basis at least 80 hours per month—an average of 20 hours per week. After contacting your local DHS office, you will receive a letter from DHS with instructions about work requirements and connecting with WorkSource Oregon. You will need to attend a work orientation or meet one-on-one with a case manager at a WorkSource office in order for certain work activities to count for meeting your requirements to continue receiving food assistance. If you have not received this letter, contact your local DHS office. More information about the work requirements and the process at WorkSource can be found here. What is “workfare” and how many hours are required? “Workfare” is unpaid or volunteer work that takes place at a DHS designated non-profit. The number of workfare volunteer hours required is based on the fair labor standard act for the total amount of SNAP benefits you receive. In general, it is a smaller number of hours such as 5 hours/week or 20 hours/month or less. The community organization needs to be an official “workfare” site for a volunteer to utilize this option and fulfill the ABAWD work requirements. Connect with WorkSource about workfare options. A person can claim “good cause” for not meeting the work or community service hours if they were sick, transportation broke down or there was bad weather that shut down the workplace. As long as someone has a job or community service slot but missed work hours for reasons “beyond their control,” DHS should accept this as “good cause” and not terminate the SNAP benefits. If this is the case, please report this to DHS. If a person does not have an exemption, after receiving the initial three months worth of SNAP benefits, a person may qualify for a second three-month period of SNAP. Certain criteria must be met, such as having worked 80 hours for one month or moving from a waived area, for this one-time extra three months of SNAP benefits. A person may also re-qualify for SNAP, if they have lost benefits because of not meeting ABAWDs requirements, by becoming exempt, such as becoming newly pregnant, or meeting work requirements. YES! If DHS terminates SNAP benefits for any reason including alleged failure to meet the new work/volunteer requirements or denies an exemption, DHS must send a written notice stating the reasons why. If you feel the decision is incorrect, you have 90 days from the date of the notice to request a hearing, and can request continuing benefits until the hearing is held. You can contact a local DHS office to request a hearing, or go to www.OregonLawHelp.org for more information on hearing rights. Quiz: Are you exempt from the SNAP Time Limits? While hunger has been steadily decreasing in Oregon, it remains persistently high. According to a new USDA report on Food Insecurity in the U.S. nearly one in seven households (14.6 percent) in Oregon were “food insecure” between 2014-16. This affects 620,000 Oregonians, and over 316,000 kids, where 1 in 4 children from low-income food insecure homes are at risk of hunger and are eligible for nutrition programs. We understand the physical, emotional, and cognitive impacts of a lack of adequate nutrition on kids. A skipped or partial breakfast or lunch may lead a child to feel frazzled and anxious during a third-grade reading exam. Over time, we know this child may fall behind a grade level, and ultimately might not graduate from high school due to a lack of essential nutrition and energy during their educational journey in school. Access to healthy nutritious food for children exists through the suite of USDA Child Nutrition Programs available including the School Breakfast Program (SBP), the National School Lunch Program (NSLP), and the After School Meal and Snack Program (ASMSP). We work with community partners including the Oregon Department of Education, to publicize and expand participation in these nutrition programs through technical assistance, outreach and marketing materials, and discrete-designed programs to boost participation. Any student is welcome to enjoy meals at their school. Whether a family pays or is eligible for free meals, the food served at school meets nutrition guidelines that helps all children and teens grow and learn. Children whose families have income at or below 185% of the federal poverty level can get free meals, as the state of Oregon covers the "reduced price" co-pay cost for families. Families over 185% of poverty pay full price for school breakfast and lunch. Children who are homeless or in Foster Care also qualify. Who can run School Nutrition Programs? All Public and private non-profit schools (high school and under), and Residential Child Care Institutions (RCCI) can participate. Participation allows schools to receive cash subsidies for each breakfast, lunch or snack served. In return, programs serve meals consistent with USDA nutrition standards and are monitored by the Oregon Department of Education (ODE). The School Breakfast Program (SBP) provides federal reimbursements to providers who operate nonprofit breakfast programs in schools and residential childcare institutions. The program is administered at the Federal level by the USDA and at the State level by the Oregon Department of Education. 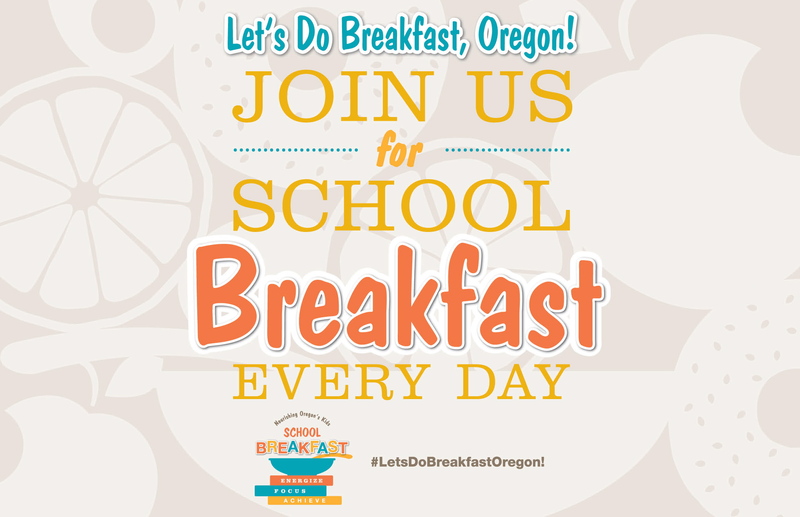 Partners for a Hunger-Free Oregon works with the Oregon Department of Education and other community partners to publicize the School Breakfast Program and support schools who participate. We identify opportunities for School Breakfast Program improvement through our work with providers here in Oregon and monitoring efforts of other states. We advocate for these improvements through state and federal policy change, like the 2015 Breakfast after the Bell bill. Students get a nutritionally balanced start to their day so they can do well mentally, physically, and socially. Students are less likely to struggle academically or have health issues. Families face challenges to providing breakfast for their kids, including tight food budgets or early-morning work, carpool, or bus schedules; the SBP provides a healthy option available for their kids. Studies suggest that students who eat breakfast increase their math and reading scores, do better on standardized tests, and improve both their speed and memory in cognitive tests. It has also been shown to positively impact absenteeism, tardiness, nurse visits, and behavioral incidents. School food nutrition departments benefit financially when they are able to reach more children in need with school breakfast; increased participation helps create economies of scale, and options such as Provision 2 and Community Eligibility Provision help yield federal reimbursement dollars to support strong programs. Schools across the country have found that substantially more children eat breakfast when it is served after the bell and free of charge for all students, when viable. By offering breakfast as part of the school day, schools can eliminate barriers such as bus schedules and stigma that get in the way of students eating this important meal. Many organizations have created tools to help teachers, schools and advocates promote school breakfast. The National School Lunch Program has been serving children nationwide since Congress passed the 1946 National School Lunch Act in response to widespread childhood malnutrition. The program aims to provide nutritious food to school aged children and support food prices by channeling farm surpluses into the school food system. The program is administered at the Federal level by USDA and at the State level by the Oregon Department of Education. The federal After School Meal and Snack Program (ASMSP) provides reimbursement to qualifying after school enrichment programs that serve free meals or snacks to their children. ASMSP is an extension of the Child and Adult Care Food Program, and is sometimes referred to as the “At-Risk” or “Supper” program. All meals and snacks are served free of charge to youth in participating after school enrichment programs. Strong Minds: By the time children come to your programs it may have been 3-4 hours since their last meal, making it difficult to concentrate or learn. This program ensures that students continue to thrive even after the school bell rings. Strong Communities: After school programs provide a safe, supervised environment during a time when many youth would otherwise be home alone, or on the street. Providing meals and snacks can be expensive, leaving program managers with a difficult choice between feeding kids and providing enriching activities. ASMSP can help you do both, saving thousands of dollars on meals and snacks that can fund program activities. The meal program is a great tool to use for approaching future funders. Incorporating this as part of your fundraising budget shows potential funders your willingness to leverage all available resources in your community. It also demonstrates a commitment to your children’s overall health and wellness. The site must be located within a school attendance boundary where at least 50% of the children are eligible for Free and Reduced (F/R) lunches. Schools, churches, apartment complexes, community centers, boys and girls clubs, tribal agencies and other organizational locations are examples of appropriate sites.